The courtyard of Ports of Call. This complex is home to several shops and restaurants. This page refers to the shopping plaza. For the accommodation, see Ports of Call Resort. Ports of Call is a shopping and retail complex in the heart of the Grace Bay tourism district. Complete with a touch of pirate-themed scenery, this plaza is within walking distance of many resorts and accommodations. 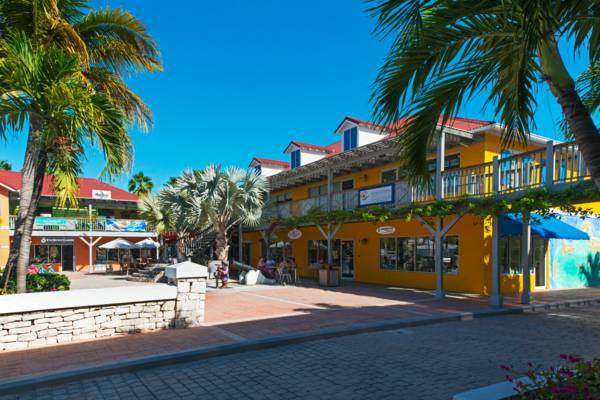 Ports of Call is also adjacent to a few other shopping plazas as well, including La Petite Place, Caicos Café Plaza, Ocean Club West Plaza, and the Graceway Gourmet supermarket. As is generally the case throughout the Turks and Caicos, there’s ample and free parking surrounding Ports of Call. The outdoor courtyard also features seating, and is a pleasant place to relax. 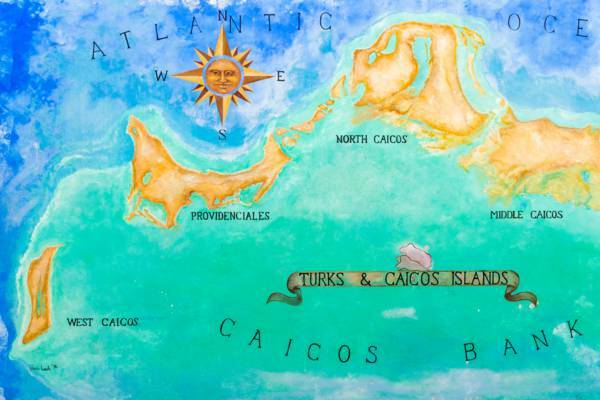 The Turks and Caicos map mural at Ports of Call. One of the most-photographed examples of art in the country is the three dimensional Turks and Caicos map on the wall of the central building in Ports of Call. Created by local artist Pamela Leach in 1996, this artwork beautifully depicts the signature ocean shades of turquoise and blue in the Turks and Caicos. When photographing the map, avoid shadows by visiting either in the morning (map will be in the shade) or later in the afternoon (map will have full sunlight. Dive Provo offers a wide array of services, from one, two and three tank dives, to custom charters and night dives. 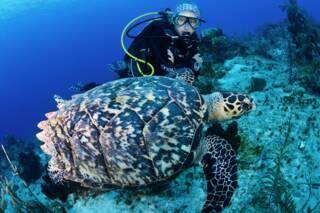 Nitrox, PADI courses, snorkeling trips and camera rental are also available. Dive Provo’s retail store and booking location in Grace Bay probably has the best selection of masks, fins and snorkels on Providenciales.